Up to the middle of the 20th century, biologists studied genes without seeing them as informational structures; information theory was an engineering tool not dealing with the meaning of messages; and, semiotics, the study of signs and their meaning, dealt only with human culture. Today - after progress in molecular biology and a naturalist turn in general semiotics - researchers are beginning to realize that genes, information and semiosis, or sign action, can no longer be understood in isolation. This insight derives from a new scientific field. Biosemiotics investigates the meaning, interpretation, communication, and habit formation of living systems, and the biochemical conditions for sign action. 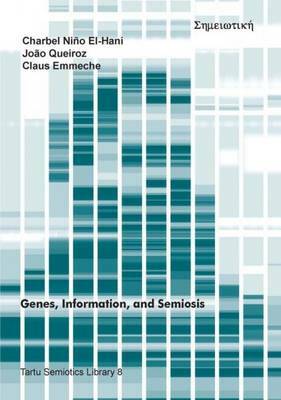 This book clarifies the information talk in molecular and systems biology by building a semiotic model of genes and protein synthesis. It is consistent with the best scientific understanding, and it is non-reductionist, integrating signs, molecules, and natural interpretation. It offers a new definition of gene in biology, and an understanding of information that does not reduce it to digital bits, but sees it as related to the forms and processes of living organisms. Readers not familiar with molecular biology or semiotics are provided with brief introductions to basic concepts. The book is a challenge to entrenched beliefs in the anthropic nature of signs and the substantial nature of genes. No scientific revolutions are offered, but a set of deeper insights into an exciting, new cross disciplinary perspective upon life and signs. Charbel Nino EL-HANI is a Professor at the Institute of Biology, Federal University of Bahia, Brazil. His research interests are philosophy of biology, biosemiotics, science education research, and animal behavior. Joao QUEIROZ is a Professor at the Institute of Arts and Design, Federal University of Juiz de Fora, Minas Gerais, Brazil. Previously, he was a professor of Semiotics and Cognitive Science at the Graduate Studies Program on History, Philosophy and Science Teaching (UFBA/UEFS), Brazil. Claus EMMECHE is Associate Professor and Director at the Center for the Philosophy of Nature and Science Studies, University of Copenhagen, Denmark. His research interests are biosemiotics, philosophy of biology, and theoretical biology.